Kind regards to all. Roger. Almost anything is possible but to build a RC plane at such a small scale requires particular building skills and very specialised (thus relatively expensive!) RC equipment. I am sure the advice would be to start larger (4 times?) and work down. Thank you so much for the warning ! My interest is not "mainstream" micro RC flying. Rather, I would like to build an "animated diorama" of the Western Front, in which I have low-flying aircraft. That is the reason I am willing to accept "tethered flight" (i.e. flying simple orbits) as opposed to full RC control. Ho hum, I'm 7 years retired, so I can afford to play! Sorry to be a bit negative but "the basic flight principles must be the same" is not quite true. At such a small scale air behaves rather differently. My suggestion would be to undertake some experiments. Build a scale 1/72 something as light as you can but as a glider and see if you can get it to glide is a reasonably stable manner with weights added to equal that of the motor and LiPo. I suspect it is easier to say than do! At the same time test to see how much thrust the motor/LiPo combination with a scale? prop actually produces. I may be wrong but my own guess is it will small indeed and nowhere near the level you will need which will be close to the total weight of the plane. The reason for this is at such a small size air is relatively 'sticky' so a plane needs substantial thrust just move it fast enough through the air to create the lift to match its weight. For a diorama you could of course 'cheat' a bit and use 'supported' model planes. They can still move but don't have to actually fly. I have a small Fokker tri plane its a foamy, I just purchased and will be schooled on a nice electric stick, it has the same paint job as the Fokker, nice, im not sure about the plane you described, but I bet its pretty cool. My pop flew this beauty in Nam, totally effective! Last edited by ron_van_sommeren; 11-06-2018 at 12:45 PM. Dankie waal, meneer (and apologies for my spelling). I shall read and inwardly digest the Wiki article on Reynolds number. I am slightly ashamed to have forgotten this, having read Engineering at Cambridge, albeit 54 years ago! I've just remembered that, buried somewhere in my loft space, I have a fascinating 30-year-old book on the subject of "flight", written by a Professor of Aeronautics from Amsterdam University, that examined the entire subject from insect flight and bird flight through to modern aircraft. It contained dozens of equations and semi-empirical graphs that showed the commonalities. Ron - as a Nederlander, does this ring any bells? I'm now waiting on delivery of a 1:72 Fokker D.VII plastic kit that I can use as a set of templates for a balsa and/or foam model. Tbc ! So, let's see if the attachment works this time! I have it here, it taught me about 'swimming' insects, and a lot more. I also learned how much jars of peanutbutter-energy it takes for a 747 to fly from Amsterdam to New York. 747 fans, and RC pilots, should read The Simple Science of Flight. 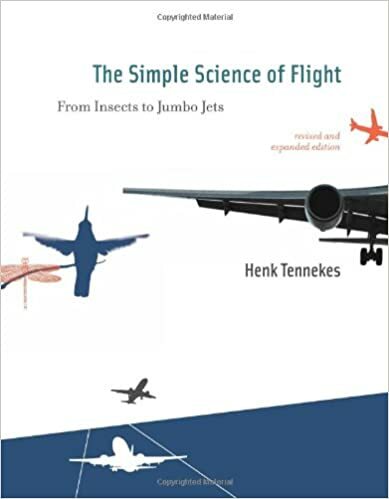 The title says it all, but Henk is also a 747 aficionado and has dedicated a whole chapter to that plane. Why it was exactly the plane needed for transatlantic flight. I have the Dutch version, easy to read, funny at times, lovely examples, no differential/integral math, a joy to read. Of course the English version can't be but less funny than the Dutch version After all, Dutch is the language of poets and diplomats. An excellent and humorous must read for modellers. Henk Tennekes was a.o. professor of Aeronautical Engineering at Pennsylvania State University. Last edited by ron_van_sommeren; 11-07-2018 at 09:06 AM. Ah its an observation air plane, cool deal! 747 is indeed a beauty and a work of art. When I was knee high to a grasshopper I flew Lufthansa to live in Germany it was a 747. Actually the AOP squadrons were for directing field artillery fire ("up-a-bit, down-a-bit, left-a-bit, right-a-bit" sort of thing). Typical operating altitude 500ft, rather susceptible to ground fire, which might be what hit my father's aircraft. Either that, or a "friendly" 25lb artillery shell. Luftwaffe records showed no fighter activity at that time and place. My father was one of only two of the squadron's original pilots to survive the war. Now I'll try and attach another Normandy photo, showing the squadron commander and the four flight commanders. My father is seated in the middle. Ultra Micro Heli's and Quads have miniature control systems ... allowing remote control etc. Honest opinion ? I think a hanging static diorama is more achievable. Would love to see it in action ! Indeed. A friend of mine, whose father builds REAL (customised) aeroplanes, has suggested that a combination of a fast-revving coarse-pitched propeller plus the two wings of a biplane will simply generate a lot of turbulence rather than a directed air flow. We shall see. I have a 5gm motor with a 6inch prop. As soon as I get a Lipo battery I shall see what it does to cigarette smoke ! There is another problem for flight in a diorama, that of scale speed. Speed is judged by humans as the rate at which something travels its own length. That is why a 747 looks so 'majestic' when flying close to the ground. At 1/72 scale a plane would have to travel really slowly to look realistic. Unfortunately aerodynamics does scale in anything like the same way. If it was truly flying a 1/72 Fokker would be a remarkable technical achievement but it would look as if it was going at almost super sonic speed! Not very realistic for a diorama. Have you seen the YouTube video of the huge Hamburg airport scale diorama. Big airliners taking off and landing very realistically at scale speed but they are most certainly not flying. View Next Unread Centennial Edition Durafly T28 Maiden! Quick Reply: Help for a beginner ?